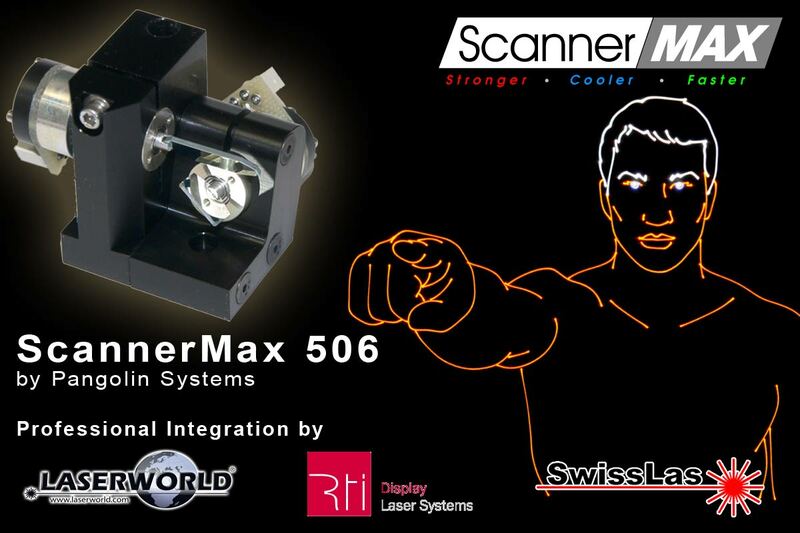 Brand new scanner product family: ScannerMax by Pangolin Systems – available for many Laserworld products now! Pangolin ScannerMax is a brand new scanner system family created by Pangolin Systems. Scanner systems (Galvos) like these are used for rapidly deflecting a single laser beam to create patterns or effects. ScannerMax scanners are designed for industrial as well as show purposes, so there are a variety of possible applications. Especially the laser show industry requires professional and accurate scanner solutions: To create spectacular laser shows it is essential to deflect the laser beam extremely fast, so that the patterns, graphics and pictures projected don’t appear to be flickering. Laserworld offers Pangolin ScannerMax galvos for many of their professional laser light systems, like for most SwissLas and several RTI units. The quality of the ScannerMax scanners is superior to the standard solution, so especially more professional users may want to go for the upgrade. More ScannerMax solutions are in development at the moment, but the ScannerMax 506 is already available to a larger scale. It speeds at more than 35’000 pps at 8° (ILDA Standard) and can do a maximum scan angle of up to 80°! More professional users will appreciate the step response time at 2° optical with only 0.18msec and the great linearity of 99.8%. For RTI products, Laserworld offers the ScannerMax Upgrade together with the high performance RayScan HP scanner driver. For SwissLas products, a special SwissLas scanner driver is used – with optimized tuning for the SwissLas laser systems.